Intelligent Grading Solution enables teachers to create and grade tests in more efficient ways. With this embedded, easy-to-maintain cloud-based solution, educators can quickly gain insight into class and exam performance - using existing MFPs - allowing for more time to focus on student achievement. 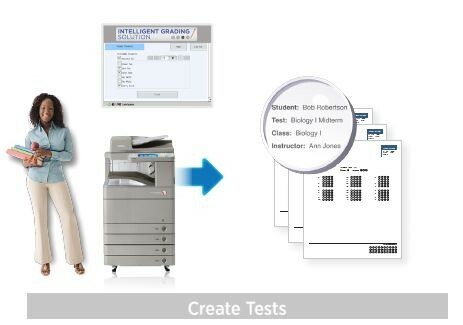 Schools varying in size and IT capabilities can easily and cost-effectively integrate the Intelligent Grading Solution into existing testing and grading processes. As the first MEAP Web application to be made available in the U.S., the Intelligent Grading Solution provies educators with the flexibility to develop and grade exams then generate detailed analytical reports directly from the MFP device.